Almost a third of Afghanistan’s security forces have turned to drug trafficking, Russia’s narcotics control agency reports. The watchdog’s director Viktor Ivanov blames foreign troops and fighting in the drug-rich region. “A concentration of foreign forces and fighting in a drug-producing state has ensured a climate of rampant desertion from the local armed forces and police,” the director of Russia’s Federal Drug Control Service (FSKN) said at the Second Anti-narcotics Ministerial Conference in Moscow. Afghanistan is notoriously known worldwide for being the prime source opiate production, including heroin, and a large producer of marijuana and hashish. The US campaigns in Afghanistan and Iraq have led to the rise of regional terrorism which added to a rise in all sorts of illegal activities, including drug production and trafficking. Drug money is a massive source of profit for the Islamic State (IS, formerly ISIS). The terrorist group makes around $1 billion annually from trafficking heroin and opium across conquered land. "According to our estimates, the IS makes up to $1 billion annually on Afghan heroin trafficked through its territory," Ivanov said in early March. What’s more, over half of Europe’s heroin now comes from the IS, he added. Together with oil and conquest, drugs have risen to the top of the terrorists’ income-generating activities. 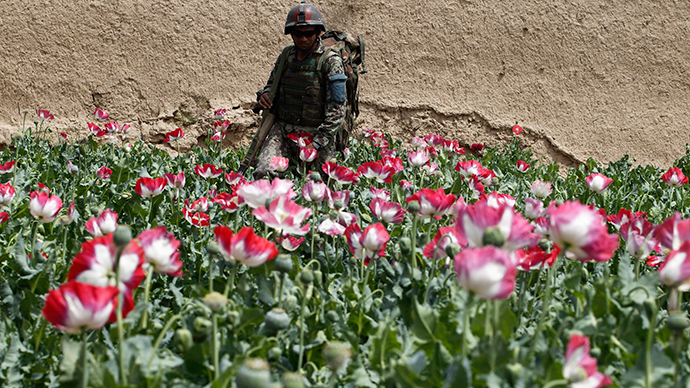 According to the International Narcotic Control Board, Heroin trafficking from Afghanistan has increased the consumption of opiate drugs in East European countries to levels higher than the world average. Ivanov’s statement on Afghan security forces’ increasing involvement in the business will come as no surprise to some, as many other forms of generating income gradually disappear due to conflict. Drugs from volatile regions are becoming a global problem, with Russian borders positioned closer to it than anyone else in Europe. In another interview, with Russian radio Kommersant FM, Ivanov attested to how for the first time the drug trade in Russia has eclipsed the defense budget, as the country approaches 1.3 trillion rubles (US$25.5 billion) spent annually on getting high. Speaking at the anti-drugs conference on Thursday, the director said adequate progress had not been reached in 1998, in the course of the last UN assembly. “It is unfortunate that the international community remains in need of a consolidated push in the fight against drugs,” Ivanov added on Thursday, reminding delegates that in the 17 years since the last meeting, opium production in Afghanistan has doubled. The anti-drugs conference comes ahead of the UN General Assembly on drugs, to be held in the fall of next year. At the conference, Russia’s FSKN was joined by BRICS, OSCE and other international organizations and partners in setting up the groundwork for the creation of a unified drugs policy, which they hope to present next year.